There is a particular kind of joy when you find the perfect novel for what you teach. 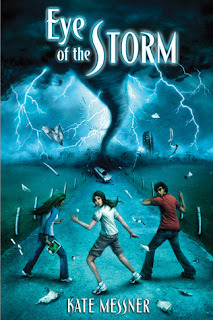 For our Wicked Weather unit, I think Storm Runners is the ideal text, and then I found Eye of the Storm. Suddenly, I am dreaming of lit circles with the two very different but excellent texts. In the future, life is very different because super storms now regularly destroy everything in their paths. Jaden's father is a scientist who has become very rich and famous creating StormSafe shelters for the US government. His Eye on Tomorrow School trains the smartest students for future careers in science. But Jaden learns that her father isn't the hero that she has always believed him to be, and that she may actually be the one who needs to save others. I loved the little touches about the future that Messner added, things that seemed likely to happen. In prisons, the inmates ride bikes to create energy. Everyone uses DataSlates as their workspaces. Genetically modified food is the norm and real organic fruit is extremely expensive. The Eye on Tomorrow School is the direction where things should be heading: full of project-based learning and real world problems. The alternative term for science fiction, speculative fiction, truly applies to this novel. I am excited to share Eye of the Storm with my students, as well as recommend it to the class I taught last year.